Welcome to the history of Ludlow Castle. Ludlow Castle is first referred to by chronicler in 1138 but its date of origin is not certain. The architecture suggests that the curtain wall of the inner bailey, its flanking tower and parts of the gatehouse-keep date from the late 11th century. 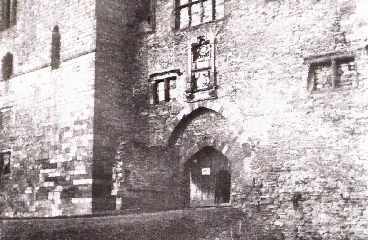 The site of Ludlow was in a corner of the important manor of Stanton, held since 1066 by the de Lacy family. The level building surface and the steep slopes to the north and west made this a fine defensive position. The rivers Teme and Corve gave further protection. Most of the castle was built of chunky silurian limestone quarried from its own site. It was one of a line of Norman castles along the marches, built to pacify the countryside and hold back the unconquered Welsh. The de Lacy and their heirs retained the lordship until the late 13th century, but in the civil wars of King Stephen's reign it was held by their enemy, Joce de Dinan. In 1139 Stephen himself besieged the castle and showed great bravery by rescuing his ally young Prince Henry of Scotland, from a grappling iron. 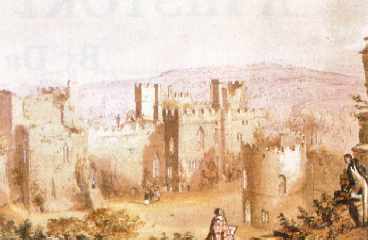 The de Lacys spent much of their time in Ireland, where they won great estates, but Ludlow remained a major power base. At times it was taken into royal hands as in 1177 and afterwards, when the Pipe Rolls record regular payments 'to the keeper of Ludlow Castle'. Many meetings were held here, as in 1224, when Henry 111 made a treaty with the rebel prince Llewellyn, with Archbishop Langton as mediator. 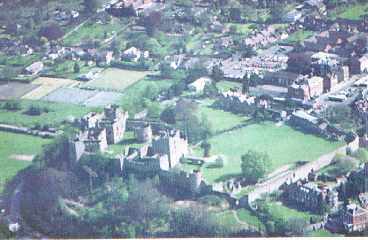 An aerial view of the castle. Its curtain wall, flanking tower and gatehouse, built in the late 11th century, are the oldest part of the castle. The building inside the curtain wall are from later periods. 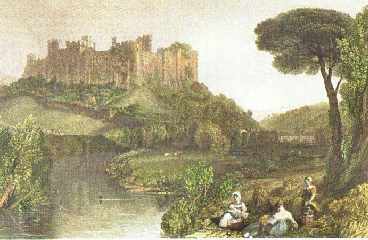 Ludlow castle painted by J.M.W. Turner from a sketch made by him in 1798. True to the romantic tradition, there is considerable 'artistic licence', especially with the foliage and scenery. The impressive north range, sketched from the top of the keep about 1840. this was built in the late 13th and 14th centuries, transforming the castle into a fortified place of high social standing.